What's going on at drive-thrus? 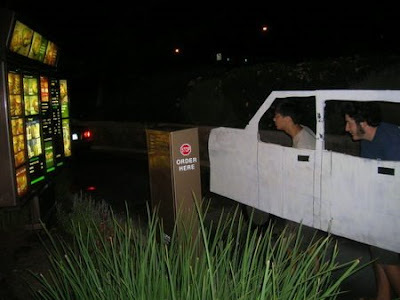 You know, those time-saving devices where you can get fast food faster? Nothing says good food like an exhaust fume-laden cheese burger. Yum. Yum. But I digress. A couple of weeks ago the case of a Nova Scotia wheel chair-bound man getting barred from Tim Horton's made the news. He made the news because he was barred from the drive-thru. 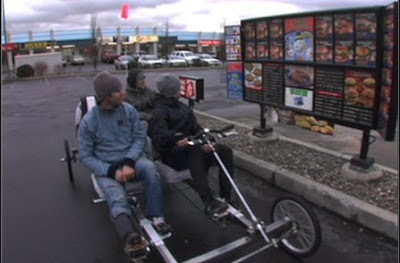 Now to my mind, a guy on a motorized scooter and a drive-thru is a marriage made in heaven. What a great idea this guy had. 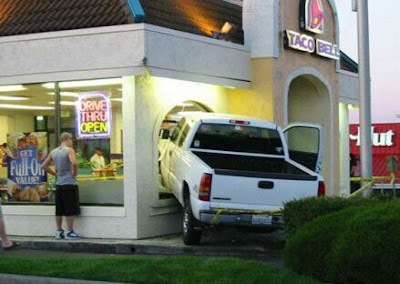 Instead of struggling up steps or a ramp, through a pair of doors, down a narrow isle and at great risk of backing into other patrons to get his "double-double" the guy decided to go through the drive-thru. Not so fast physically disabled guy, said Tim Horton's, if you want that double-double you've gotta come in and get it. He's threatening to go to the Human Rights Commission over this and I say "You go, guy!" Meanwhile, last week, at the other end of the country, police were looking for some naked guy who stole a lady's fries at a Wendy's drive-thru. Yep, you read that right. As the drive-thru attendant was handing the lady her order some guy, naked as a jaybird, sped between them, grabbed the fries and kept on, er, truckin'. Now this raises a number of questions, chief among them where did he come from? Was he out for a jog in the buff and got a hunger pang and thought "I know, I'll just run through the first drive-thru I see!" It was likely a prank as his buddy was waiting for him in a van in front of the restaurant. While the first example makes me merely shake my head, the second makes me think the guy took the Burger King slogan a little too far (even though it was Wendy's). When they said "have it your way" they meant choice of condiments not clothing optional! And it strikes me they'll have to add "pants" to that sign "no shirt, no shoes, no service". I like that last one. If a car is required, who said it has to be "real". As for the scooter-guy, that's just sad. I would say let him use the drive-thru if he "drove" his scooter into the parking lot. If the handicapped man loses his case I would be surprised. What is the big effing deal? As long as their are college kids and drive-thus - pranks will be had. Love the pic of the college kids and you figure the poor stiffs working there could use the laugh. waltsense: A former streaker? Say, you don't live in Vancouver, do you? Hannah: That picture is priceless!